When data is your business, knowing the source and being mindfully reflective of how you release the results is important to your success. As guests, employees, and clients grace the lobby - a detailed pattern of round mirrors reflect the source of all that critical information: people. From workstation & circulation to the finely detailed huddle spaces of vertically strung cat6 cables or steel clad glass markerboards- the transmission of information and communication is interwoven through the varied spaces reinforcing an open source atmosphere of shared data. 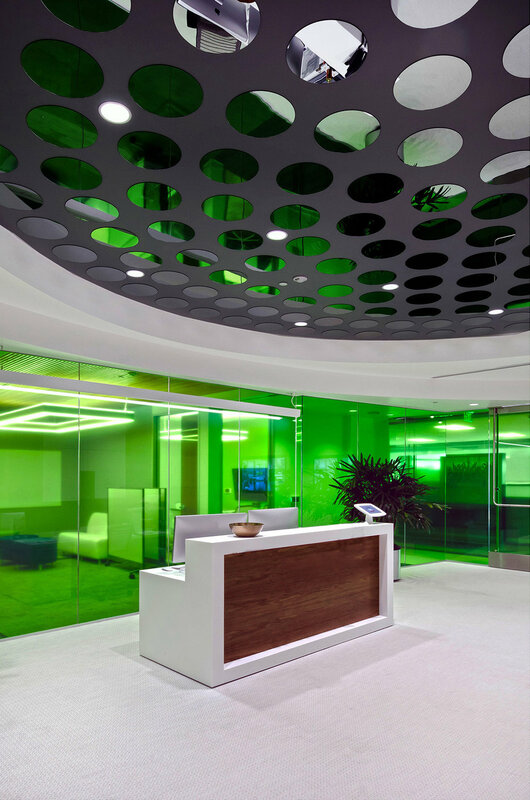 Crafted placement of carpet tiles reinforcing the company brand give direction and pattern to the circulation of spaces, reinforced by a clouded ceiling, screened huddle spaces, and dotted pendant light nodes.